The Parades Commission, which adjudicates on contentious parades in the North of Ireland, said marchers must make their return march by 4pm on July 12. It said the timing was brought forward to reduce public disorder. The shops on the Crumlin Road have long been a flashpoint for trouble during ‘the Twelfth’, the busiest of the Protestant marching season. The parade has been forced through the area for the past three years, resulting in riots. Dee Fennell, from the Greater Ardoyne Residents Collective (GARC), said they will be holding a protest parade in opposition. “Historically when the parade passes there’s always a recipe for violence, violence that we would be opposed to. We’re going to have to take our lead on the day and take stock over the next 24 hours and then issue a statement regarding our own parade,” Mr Fennell added. A second local residents group, CARA, which is aligned with Sinn Fein, said the determination was “insane, defying all logic”. “This decision means there will actually be three [parades] on the same day,” it said. CARA said it would also hold a smaller protest during the parade. On Saturday, the Orange Order’s contentious Whiterock Parade in west Belfast passed off without incident. But the week ahead is the height of the marching season and traditionally the most difficult week of the year in the north of Ireland. Hundreds of sectarian coat-trailing parades will be taking place across the North. In the county Armagh city of Newry, a “major demonstration” is being organised by the Orange Order on the 12th of July. Several thousand members and supporters of the order along with approximately 40 loyalist bands are expected to be bussed into the overwhelmingly nationalist town. In previous years the people of Newry have had to endure drunken bandsmen openly urinating and drinking in the street, Mr Murney said. “If that’s not bad enough many of these bands will be displaying the flags and symbols of unionist death squads who murdered and killed innocent people and who colluded with British state forces in the process,” he added. In County Fermanagh, nationalists in Newtownbutler are opposing an Orange Order march through the village today [Friday]. A protest has been organised against the parade which will involve 20 bands. John Connolly, the protest organiser, said the parade had raised tensions and he urged people to join their demonstration. “It is clear that the residents of Newtownbutler are completely opposed to these marches through the village, a village which has an overwhelming majority of a 98 per cent nationalist population,” Mr Connolly said. “The bandsmen do not live in the village. 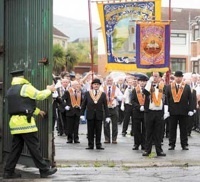 In the nationalist County Antrim village of Crumlin, an Orange Order parade has been given the go-ahead with very minor restrictions on the return leg of the journey. County Antrim Orangemen are to muster 50 bands and more than 4,000 participants to march through the village on the 12th of July. A ‘Twelfth’ parade of that size last went through the village in 1998. Since then there has been a sizeable demographic change in the village which is now 80 per cent nationalist. And earlier this week, the Orange Order said it would like to extend its marching season -- with a parade through Dublin. In what was described as a “historic” address, the the Orange Order Grand Secretary Drew Nelson, told Irish senators that his organisation wanted a “normalisation of relationships within these islands”. Mr Nelson was the first Orangeman ever to address the Seanad, the upper chamber of the 26-County parliament. In 2006, a previous attempt to organise a loyalist parade through Dublin, the ‘Love Ulster’ parade, resulted in intense rioting and civil disorder. Seanad chairperson Paddy Burke described the visit as a “milestone” and a “mark of progress”. However, there was criticism among nationalists that the openly sectarian organisation had been allowed such a platform. eirigi’s Breandan Mac Cionnaith said the Orange Order was “not only discredited in Ireland but in Scotland as well”. Sinn Fein president Gerry Adams said Mr Nelson’s address was “significant” but said “it is where we go from here that is important”. “There are a small number of areas in the north where parades are contentious,” he said.